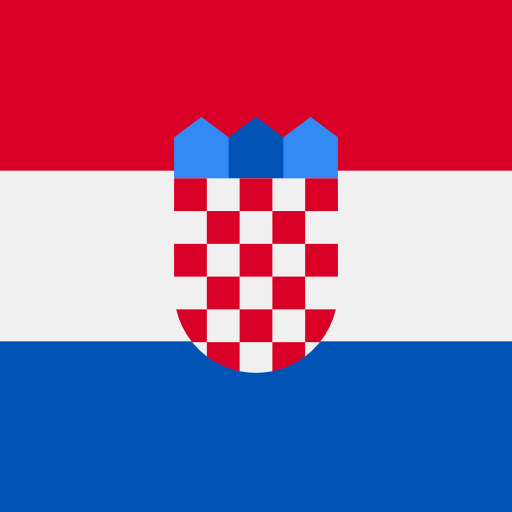 Camping Krk's island location off the beautiful Croatian coast sets it apart from other holiday camping sites. Choose a spacious mobile home designed for families, or enjoy camping luxury in a premium mobile home. 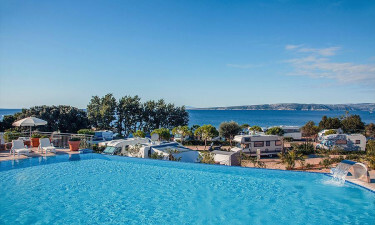 Book your luxury camping holiday with LUX-camp, and get ready for fun on the island of Krk. Why choose Camping Krk for your camping holiday? Our holiday camping site is 20 minutes' walk from Krk's Old Town, with its ancient city walls, cobbled streets and Roman ruins. It's a popular destination for shopping, dining and boat trips. To go further afield, why not hire a bicycle and explore this beautiful, peaceful island? There's plenty for the whole family to do at Camping Krk. Swim or sunbathe at the main pebble beach, the naturist beach or the dog beach, especially for our four-legged guests and their owners. 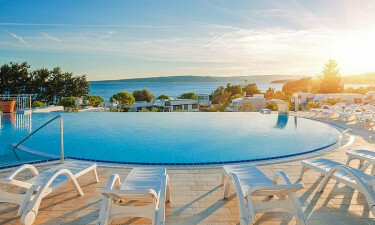 Kids can enjoy their very own pool and water park, as well as the outdoor pools for the whole family, while adults work out in the infinity pool or enjoy a range of relaxing treatments at the spa. Kids have their own club, while adults can join in Pilates or aqua aerobics classes. With facilities for tennis, volleyball, mini golf and much more, as well as boat hire, the days will be packed. In the evening, enjoy dancing, open-air film screenings or a live band. Camping Krk is proud to be the first five-star, family-oriented eco campsite in the region. With solar collectors, wastewater treatment and waste separation, we're taking care to protect the beautiful environment of the Croatian Adriatic. Our holiday camping site offers a wide range of options for lunchtime and evening dining. The Politin Bistro, by the outdoor pool, has a terrace with sea views and serves traditional Mediterranean cuisine, as well as pizzas from a wood-fired oven. For a quick sandwich or a cocktail as the sun goes down, try the nearby Politin Beach Bar. You can enjoy live music in the evenings, and our friendly staff will even bring your drink or snack to you on the beach. Then it's a short stroll back to your luxury mobile home. It's easy to stock up on beach supplies or buy the ingredients for a tasty meal back at your mobile home. In our piazza, you'll find shops, a food market and a bakery offering fresh bread. 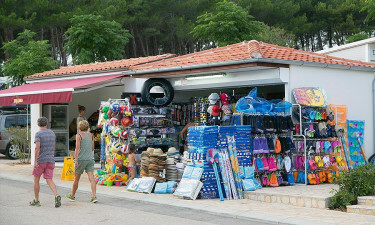 Top up at the mini supermarket, buy your newspaper, beach goods and souvenirs at our handy kiosks, or grab an ice cream at the beach. There's a post box at the reception for your postcards home.